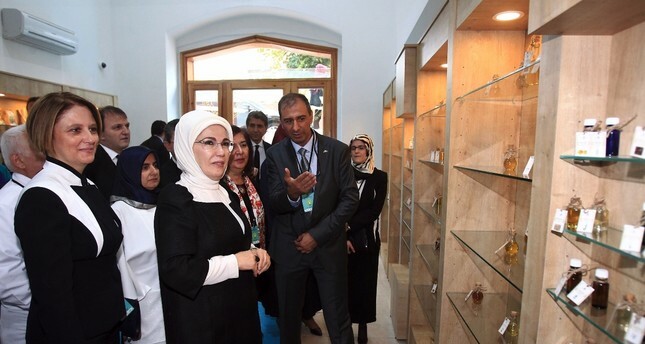 First lady Emine Erdoğan attends the opening of a phytotherapy center at a university in Istanbul, September 15, 2015. Erdoğan is a key promoters of traditional and complementary medicine in Turkey. As more and more countries turn to traditional and complementary medicine, Turkey is following suit and bringing together international experts for a congress delving into the issue. Congress' honorary president first lady Emine Erdoğan will open the four-day Istanbul event next week held under the auspices of the Turkish Presidency and Ministry of Health. Unfairly derided in the past in Turkey in favor of "modern" medicine, traditional and complementary medicine practices have made a comeback in the country, like in the rest of the world. Turkey accentuates a rich heritage of the Islamic world where ancient medicine outpaced medicine in the Western world and boasts a legacy of Ottoman-era "şifahane" or hospitals. The event which will open on April 24, will focus on traditional and complementary therapies in chronic diseases and is entitled "Right Dosage, Proper Usage." Apart from conferences and panels, the event will also host a fair on traditional and complementary medicine practices. Along with the first lady, Health Minister Fahrettin Koca and senior officials from the World Health Organization (WHO) will be among the speakers of the event while Turkish and foreign experts in different branches will speak about the use of alternative, complementary methods in treatment. Participants include Dr. Vangelis Zafeiriou who heads the Greek Homeopathic Medical Society, professor Li Wanyao, the head of a prominent group of apitherapists, a branch of traditional medicine that uses honey bee products for health benefits, professor Melissa Mercadal, an expert in music therapy, among others. The event also aims to boost Turkey's position in the field and fight misconceptions on the issue while establishing international collaboration in the development of traditional and complementary medicine. Turkey, which has carried out some landmark reforms in health care, from modern hospitals to easy access to health care services, launched its first serious approach in the field in 2012, when the Health Ministry inaugurated a department focused on traditional and complementary medicine. Standards and regulations were introduced to traditional medicine while medicine faculties at universities opened clinics. The most recent and comprehensive regulation on clinical research standards were rolled out earlier this month and Health Minister Fahrettin Koca says it was an important step to build a solid basis of evidence on the benefits of traditional and complementary medicine. Efforts aim to stave off concerns that this branch of medicine replaces modern medicine. Authorities highlight that as its name implies, it is complementary and cannot replace prevalent methods of treatment. Only certified doctors are allowed to practice under the supervision of the Health Ministry. Today, 56 university hospitals host traditional and complementary medicine centers which primarily conduct research and development and education work. Some 3,350 physicians are certified to practice it. Private and public health facilities, on the other hand, host 807 centers, offering complementary treatment. More than 40 panels and conferences will be held throughout the event where more than 120 experts will speak and an awards ceremony will be held to recognize the work of experts.